Designed specifically for clinical waste, our Yellow Disposable Bags and Tape Sets are a quick and effective way of maintaining optimal hygiene and defence against cross contamination in healthcare workplaces. 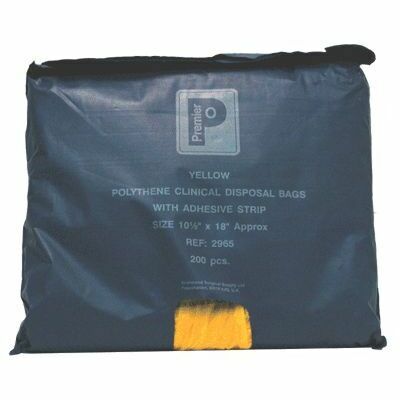 With their sizeable dimensions, each of these large refuse bags has been colour coded in yellow for clear identification as a clinical waster tool while the full-length adhesive strip can be used to attach the bag to surfaces or seal away the contents safely. All 200 disposable bags have been supplied in a soft, plastic casing which allows each bag to be removed easily while safely storing the others for future use. For ordinary waste, our large collection of Bin Bags and Black Sacks are available to browse and purchase online today.